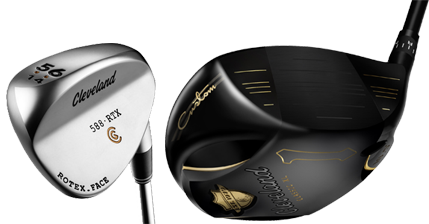 Cleveland Golf’s club line for 2013 includes a new wedge design, two new irons and two drivers – one of which joins the adjustability race along with virtually every other club maker. Release date for all is set for mid-February. 588 MT irons (Mid Trajectory) irons along with the new 588TTs join the other members of the 588 family (588 Altitude, 588 Forged CB and 588 Forged MB) already on the market. The MTs have a hollow construction and the same blade length within a set but with blade heights progressively increasing in the higher lofts. MAP is $699.99 for an 8-piece steel set and $799.99 for an 8-piece graphite set. The 588TT (Tour Trajectory) irons also have constant blade height and progressive length but are not hollow, having a cavity back design. Pricing for an 8-piece set in steel is $699.99 and with graphite shafts $799.99. The two new drivers are the Classic XL with the largest and deepest face ever made by Cleveland and the Classic XL Custom, their first adjustable driver. The Classic XL uses a variable face thickness construction and the stock shaft is the Miyazaki B. Asha for a very competitive price of $249.00. The Classic XL Custom is constructed similarly but the hosel has 12 settings so players may customize face angle and ball flight. Its stock shafts are the Miyazaki™ JDL™ 6 (mid-launch), the Miyazaki™ JDL™ 5 (lightweight, mid-launch), the Mitsubishi Fubuki Tour 53 (high launch) and the Matrix OZIK 6M3 Black Tie (low launch). 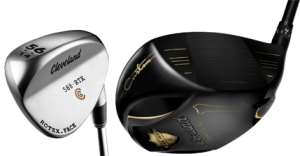 Cleveland may have been late to the adjustability party but as with the Classic XL, pricing of the Classic XL Custom is attractive at $329.99. Finally, there will also be a Classic™ XL Fairway with Matrix OZIK XCON-6 shaft for $179.99 and a lineup of Classic Hybrids with a two rail sole in a variety of lofts for $149.99.